Hello Dosto kya aap jante hain oppo ke brand new smartphone oppo f9 specifications or features kya kya hain. aaj ke post me mai aapko oppo f9 smartphone se related puri information bataunga. Agar aap oppo f9 smartphone ke bare me acche se janna chahte hain toh iss post ko pura read kare. 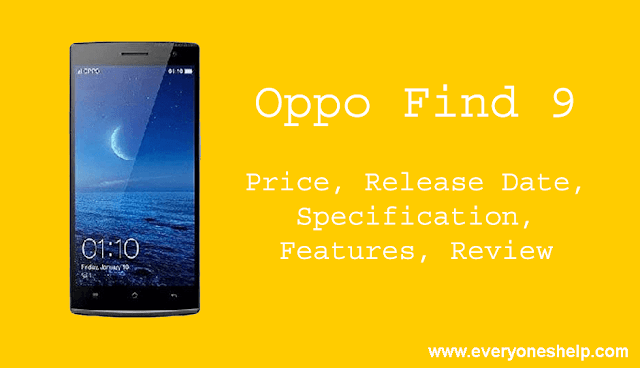 oppo find 9 Smartphone 27th june 2018 ko launch ho raha tha par kuch reasons ki wajah se iski release date ko extend kar diya gaya. Andaza lagaya ja raa hai ki 21 august 2018 tak market me a sakta hai. Bataya ja raha hai iss phone mai super-fast vooc technology hone se aapka mobile phone maximum 15 minutes me charge ho jayega. Oppo f9 smartphone two variants me launch hoga 64GB or 128 GB. Agar aap 64 GB wala variant lete hain to aapko 4 GB RAM ke sath Snapdragon 653 processor or agar aap 128 GB wala variant lete hain to aapko 6 GB RAM ke sath snapdragon 835 processor millega. Oppo f9 smartphone mai primary security ko dekte huye inbult fingureprint sensor bhi milega. Oppo f9 me 3G, 4G wifi and Bluetooth connectivity options available hain. Oppo find9 ki screen QHD Amoled Multi touch display hoga jiska resolution 2560 X 1440 at 534 ppi hoga. Dosto me asha karta hu Oppo f9 Specification, Features, Price, Release Date & Review post aapko pasand aayi hogi. Agar iss post se judhe huye aapke questions ho toh mujhe comment karke jarur bataye.